Food that shapes you: how diet can change your epigenome. Epigenetics describes the cellular processes that determine whether a certain gene will be transcribed and translated into its corresponding protein. The message can be conveyed through small and reversible chemical modifications to chromatin. For example, the addition of acetyl groups (acetylation) to DNA scaffold proteins (histones) enhances transcription. In contrast, the addition of methyl groups (methylation) to some regulatory regions of the DNA itself reduces gene transcription. These modifications, together with other regulatory mechanisms, are particularly important during development – when the exact timing of gene activation is crucial to ensure accurate cellular differentiation – but continue to have an effect into adulthood. The effects of early diet on epigenetics are also clearly visible among honeybees. What differentiates the sterile worker bees from the fertile queen is not genetics, but the diet that they follow as larvae. Larvae designated to become queens are fed exclusively with royal jelly, a substance secreted by worker bees, which switches on the gene programme that results in the bee becoming fertile. An insufficient uptake of folic acid is also implicated in developmental conditions in humans, such as spina bifida and other neural tube defects. To prevent such problems, folic acid supplements are widely recommended for pregnant women and for those hoping to conceive (see Hayes et al., 2009). What about the dietary effect on epigenetics in adult life? Many components of food have the potential to cause epigenetic changes in humans. For example, broccoli and other cruciferous vegetables contain isothiocyanates, which are able to increase histone acetylation. Soya, on the other hand, is a source of the isoflavone genistein, which is thought to decrease DNA methylation in certain genes. Found in green tea, the polyphenol compound epigallocatechin-3-gallate has many biological activities, including the inhibition of DNA methylation. Curcumin, a compound found in turmeric (Curcuma longa), can have multiple effects on gene activation, because it inhibits DNA methylation but also modulates histone acetylation. Figure 4 shows further examples of epigenetically active molecules. Most of the data collected so far about these compounds come from in vitro experiments. The purified molecules were tested on cellular lines, and their effects on epigenetic targets were measured. It remains to be proved if eating the corresponding foods has the same detectable effect as has been seen in cellular models (Gerhauser, 2013).Epidemiological studies, however, suggest that populations that consume large amounts of some of these foods appear to be less prone to certain diseases (Siddiqui et al., 2007). However, most of these compounds not only have epigenetic effects but also affect other biological functions. A food may contain many different biologically active molecules, making it difficult to draw a direct correlation between epigenetic activity and the overall effect on the body. Finally, all foods undergo many transformations in our digestive system, so it is not clear how much of the active compounds actually reach their molecular targets. 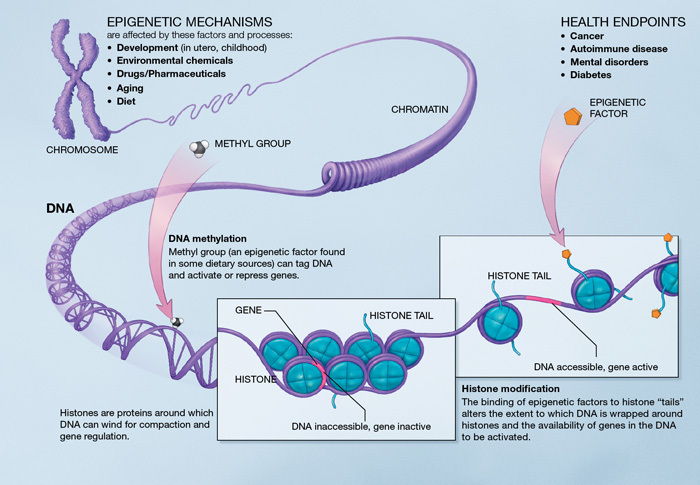 As a result of their far-reaching effects, epigenetic changes are involved in the development of many illnesses, including some cancers and neurological diseases. As cells become malignant, or cancerous, epigenetic modifications can deactivate tumour suppressor genes, which prevent excessive cell proliferation (Esteller, 2007). Because these epigenetic modifications are reversible, there is great interest in finding molecules – especially dietary sources – that might undo these damaging changes and prevent the development of the tumour.